Javelin Technologies is supporting top Canadian athlete Liz Gleadle as she trains to be a repeat Olympian. On June 21, Gleadle will visit with employees and customers of Javelin Technologies in Vancouver and use 3D-printed scissors to cut the ribbon at the official opening of their new 3D design training centre and 3D printing lab. See the 3D-printed items Gleadle designed, as well as some of the coolest 3D designs made by inventive Vancouverites. On June 22, Javelin's B.C. team and the media will see Gleadle in action and have a chance to learn how to throw javelin. 1. Tuesday, June 21, 2016 at 10:30 a.m.
Liz Gleadle (@Javelizz) is a Canadian track and field athlete who competes in javelin and is currently ranked sixth in the world. Gleadle took the gold medal at the Toronto 2015 Pan Am competition with a clutch throw of 62.83 metres. In May 2015, she broke her own Canadian record (throwing 64.83 metres, a personal best) while winning the Golden Grand Prix meet in Kawasaki, Japan. On May 8, 2016, she captured top spot in that same event. At the 2012 London games, Gleadle qualified for the final with the 11th best throw overall and finished 12th in the finals. She was born in Vancouver, BC and is now based in Lethbridge, AB. Javelin Technologies sells and supports SolidWorks® 3D design software solutions and offers a range of Stratasys 3D printers. Gleadle has been collaborating with Javelin's applications experts on two 3D design projects: an insert for her carrying case to keep her cherished javelins safe and a custom physiotherapy aid. 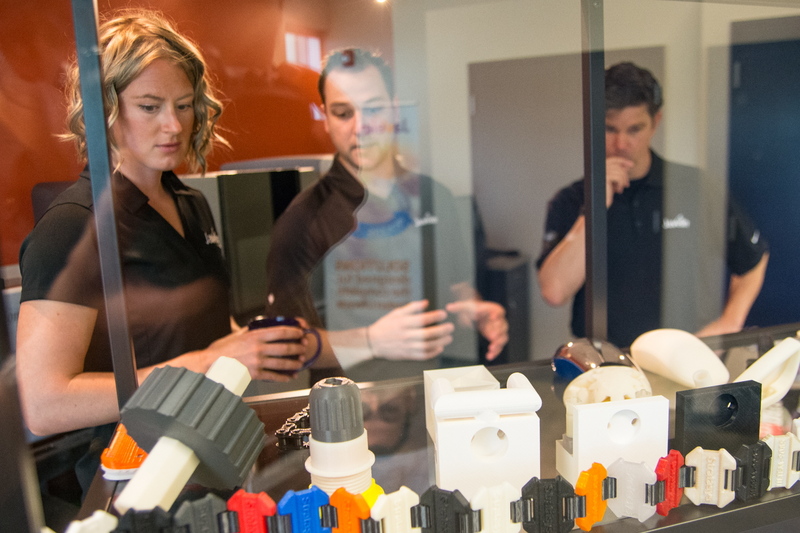 In May, Liz Gleadle visited Javelin's 3D printing lab in Calgary. Joe Vetere and John Carlan show Liz around. 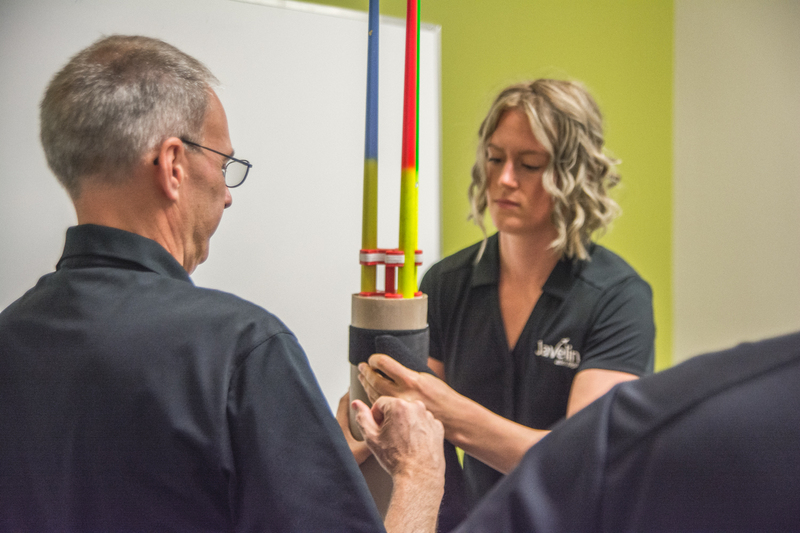 Javelin's Ted Lee shows Liz Gleadle the final 3D-printed javelin holder she designed to keep her javelins safe during transport. 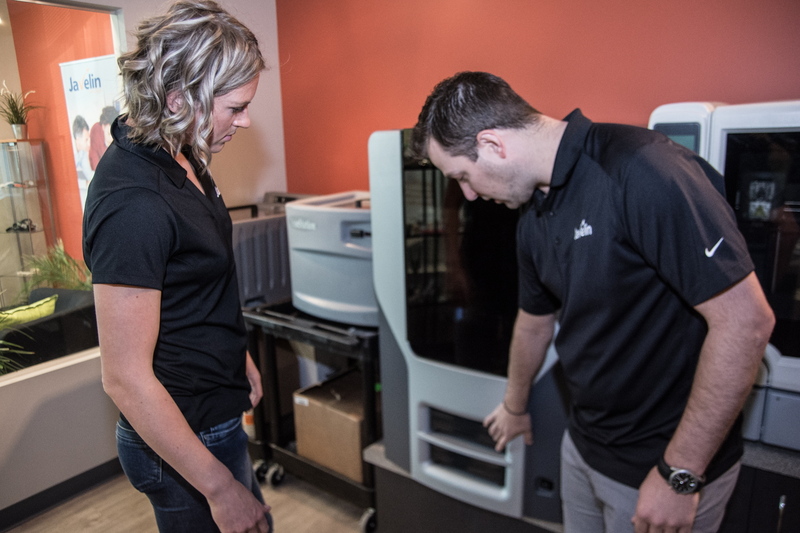 Liz Gleadle learns more about 3D printers from Joe Vetere of Javelin Technologies during Liz's visit to their Calgary offices. Liz Gleadle is Canada's top female javelin athlete. She will compete in the Rio Olympics in August 2016.